"It has been a slugging match so far, and one or the other has to break first. You may be assured it will not be the First Division!" 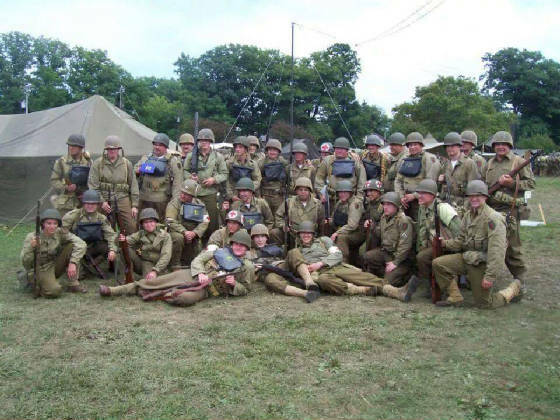 We are a group of living historians that are located in Western New York who primarily portray Second Squad, 1st Platoon, Dog Company, 1st Battalion, 16th Infantry, 1st Division of the United States Army during the Second World War. We participate in a variety of living history displays as well as tactical events. The purpose of this organization is remembering and honoring the memory of the World War II Veterans. The goal is to accurately depict the life of the average combat soldier during World War II. This unit, just like its original, is made up of men from all walks of life: Students, police officers, firemen, laborers, a cross section of American society. As a soldier in Dog Company, you will fight in exciting battles against the best units of the German Wehrmacht, the Fallshirmjager, and the crews of the feared Panzer Divisions. Through this undertaking, you will learn about the experience of the World War II soldier that cannot be achieved by simply reading a book. You will learn about the hardships and sacrifices of the front-line infantryman first hand, and grow to appreciate the sacrifice paid by veterans. As a member of an infantry rifle squad, you will learn what it means to be a part of a team, fighting fierce enemies alongside friends and fellow soldiers. Dog Company is also open to other impressions. Would you prefer to go to war as a combat correspondent, telling the story of the men in the field? Or perhaps your interests lie in being the grizzly old motor pool sergeant, or saving your comrades lives as a combat medic? For more information,on joining our band of brothers, see our contact page. DUTY FIRST, SIR, DUTY FIRST. NOTICE / DISCLAIMER: Dog Company is not associated with any militia, mercenary or paramilitary groups, foreign or domestic. Dog Company is a non-political historical group dedicated to preserving the memory of the WWII soldier. As such, we do not support any racial or political view points, or editorial views expressed by others.